Donuts are my favorite. They’re more than my favorite. They’re in a league of their own. If I ever play a sport, that’s what the team name will be. But seriously guys, if you know me you know that donuts are my thing. My best friend manages a cute little island donut shop so I basically had to make this square. I have made the donut itself before when she asked me to make her some crochet donuts to go with her Christmas decorations at the shop last year! I really just added a granny square to that pattern and voila! Donut granny square. I hope you guys love this one as much as I do!Here is the handy video tutorial! Using a piece of variegated yarn (or several smaller pieces of multicolored yarns), thread a tapestry needle and sew on “sprinkles” about 1cm long all the way around the frosting, finish off, weave ends. *At this point use your long frosting tail to sew sprinkled frosting onto donut base. 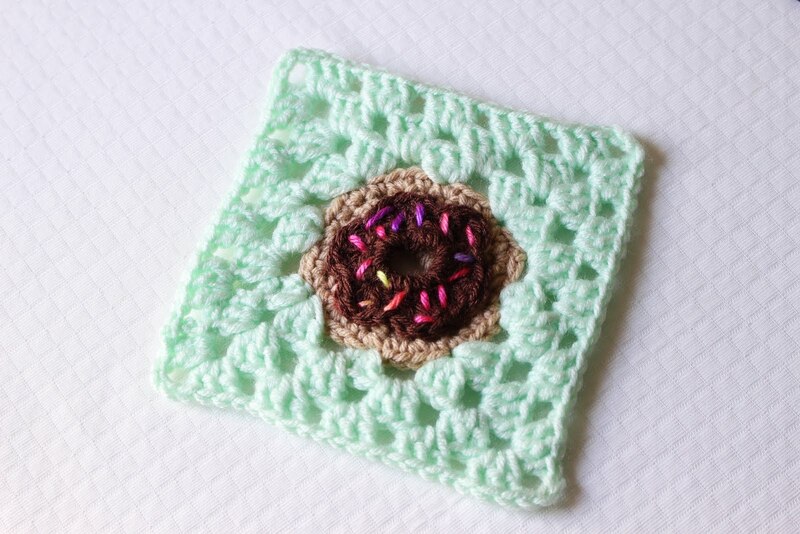 And there you have the donut granny square! What flavors will you make?